For the past few years I have been making quilts for my nieces and nephews as they have turned 8. It seems like all of the kids were born in groupings and in the past year 2 nephews and my daughter have all turned 8, they are keeping me busy! This quilt is for our nephew Aiden. He turns 8 this month and that is the age in our church when kids are baptized. We are going to miss his baptism because of a conflict, so this one is going to have to go in the mail. 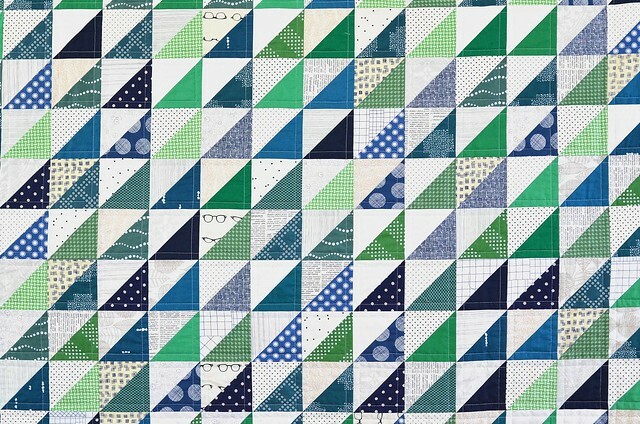 I used the backing fabric for the color inspiration and went with a variety of blues and greens. The quilt top is made up of 3.75" finished half square triangles so this involved a lot of trimming! I cut my binding strips 2.75" wide which is what I have been doing more and more often. When I first started quilting I always used 2.25" wide binding strips, then moved on to 2.5", and now I am preferring 2.75". One thing that I like about the wider binding is that it seems to be easier to make a nice, crisp corner. Finished size: 57" x 68"
Beautiful! HSTs always look so classy. I definitely find the same thing with wider binding. It's muchard easier to work with and the pretty corners seem much more achievable. Very nice! I like this alot! What size do you usually shoot for? Lap? Twin? Very sharp! A question about the wider binding: where does the extra fabric lie? Is it out a little from the quilt edge? Or folded farther on the back? Still a quarter-inch seam allowance? I see the binding on with more than a quarter inch seam allowance. It ended up closer to 1/2". I am doing the same for my nieces and nephews. I have 23 ( in total include 7 greats. 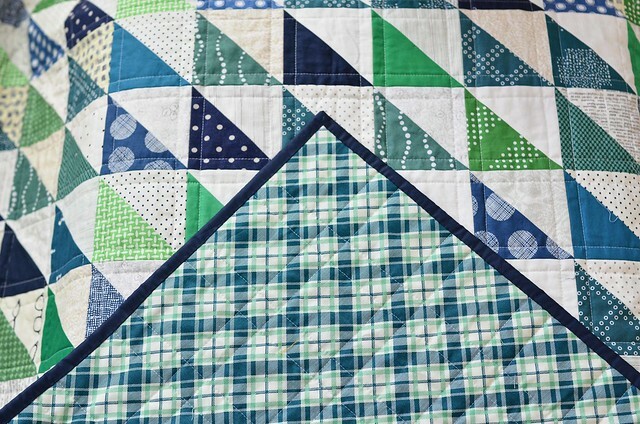 Plus there are 4 siblings to make quilts for. Definitely busy here. 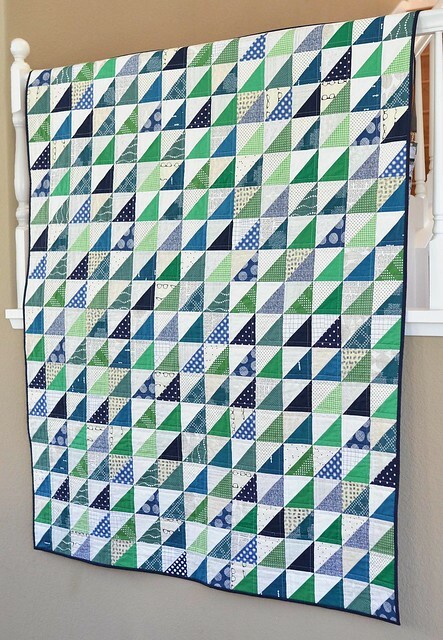 Love the classic and simple design of this quilt. Your nephew should love this. I used more than 1/4" seam allowance, it was closer to 1/2".